BOSTON (CBS) — A man on the Internet wrote that the Patriots are cheaters. This alone might not register as news, considering it is the rallying cry of message board trolls and general morons all around the country on a daily basis. In fact, writing that the Patriots and Bill Belichick are cheaters has become a sort of cottage industry. Yet this time, it comes from a professional writer, a man writing for the respected once-respected Sports Illustrated. The story comes from Michael Rosenberg, and it’s noteworthy because for all of the cheating accusations levied against Belichick and the Patriots, these may be the most absurd. And because these are the most ridiculous, unfounded and frankly stupid things ever written about the head coach of New England, I believe this may be the tipping point. There is no way to outdo this. So if you will allow, I will lay out the accusations made by Rosenberg, and then I’ll explain why each claim is more ridiculous than the last. As background, the Patriots videotaped opposing teams’ coaches on the sideline in 2007 from areas they shouldn’t have been filming, and because of that, the whole world believes them to be football’s greatest cheaters. In the past two weeks, they’ve been accused by Ravens head coach John Harbaugh of employing deceitful tactics with some formations and accused by the Colts of using slightly under-inflated footballs during their 45-7 rout of Indianapolis in the AFC Championship Game. “Easily” is an odd word choice here. The AFC Championship Game was one of just two NFL games played last weekend. Do you know what that means? That means there are cameras everywhere. Literally, everywhere. NFL Films bragged that it brought 47 cameras to games on wild-card weekend, so how many do you think were inside Gillette Stadium on Sunday night? If some $10-an-hour ball boy was sticking a needle in footballs on the sideline, it would be on video and the “investigation” would be over after about three minutes. Thanks for playing. Next. If there was an advantage for Brady, the quarterback had a funny way of showing it. That was Brady’s fifth-lowest passing yard total of the season. This is stupid. This is lazy. This is irresponsible “journalism” from Sports Illustrated. This should not be published, period. I wonder every single day if I’m going to get hit by a comet and wiped off the face of the earth. It does not mean it’s going to come true. “Reporting” on what opponents wonder is pathetic. Again, this is garbage. You either report this type of “information” via respectable sources, or you don’t publish it in a story. This reads a lot more like the paranoid Steelers/Colts/Rams/Eagles fans who flood message boards with “Cheatriots” and “Belicheat” than it does a man who (presumably) earned a degree in journalism. Frankly, it’s embarrassing. Let me rewrite this sentence for you, Mikey baby: Bill Belichick used a legal formation last week, and the NFL confirmed it was legal, yet I’m putting it in this cheating story anyway. Despite John Harbaugh’s complaints, and despite Rosenberg’s assessment, the Patriots did not run a hurry-up on the drive when they swapped out a lineman for a running back or tight end. Instead, Josh Kline jogged to the sidelines, and Danny Amendola jogged on. Shane Vereen approached the referee, declared himself ineligible, the referees announced it, the Patriots huddled and then went to the line. The ineligible receiver had been announced; the Ravens weren’t smart enough to leave him alone. Instead, they left Michael Hoomanawanui (a very eligible receiver) wide open. The play was so successful that the Patriots ran it two more times — once with Hoomanawanui as the ineligible guy, and once more with Vereen. On the second time Vereen was used as the ineligible receiver, Vinovich actually announced, “Number 34 has been declared ineligible. Do not cover number 34.” The referee actually told the defense which player they shouldn’t cover. Yet the Ravens still covered him! And this is all Bill Belichick’s fault. Because Spygate. Good stuff. Again, this is not true. At all. The Ravens had a chance to substitute. They just failed to do so correctly. They twice got called for too many men on the field on that drive, because they were in disarray. But they did have time to get 12 men on the field. The Ravens failed to adjust because they were unprepared, not because they didn’t have time. Big bad Bill Belichick, intimidating a professional NFL referee who is going to officiate the Super Bowl. That’s quite the suggestion, but Vinovich is a big boy. 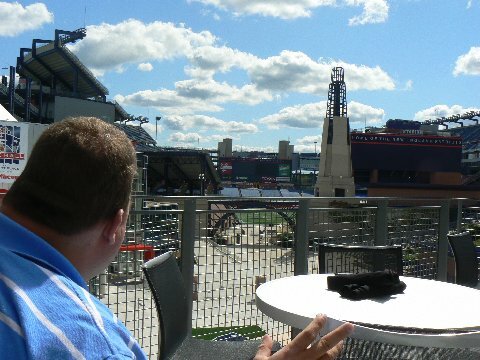 “On one end of Gillette Stadium is a lighthouse, the stadium’s signature architectural feature. But if you sit behind the opposite end zone and look at the lighthouse, you will notice something else: An enormous television beyond the lighthouse, in the parking lot. OK, where to begin … OK. I’ll start with this: There’s no way Michael Rosenberg can be serious with this, right? Let’s tear it apart one piece at a time. Rosenberg claims the TV is “enormous.” It is not enormous. The video board that sits outside of CBS Scene restaurant is not larger than the in-stadium video boards, which are, you know, in the actual stadium. It’s also stationed roughly 250 yards away from the 50-yard line. So if Bill Belichick wants to look at this video board while standing at midfield, his 62-year-old eyeballs are going to have be at their very best for him to gain this supposed advantage. (Seriously, click here and look at how far away CBS Scene is from the field.) It’s also not a crisp picture. It wouldn’t really classify as HD, and it pales in comparison to the quality of the in-stadium video boards. Secondly, there is the fact that if a team waits to see a replay on the TV broadcast, it’s going to be too late to throw the challenge flag about 90 percent of the time. Instead, coaches in the booth are relied upon to be quick to make the call, and no, coaches in the booth cannot see the television located in the courtyard outside the stadium. Also, just like in any other NFL building, the stadium ops crew works very quickly to get replays up on the video board if there’s a questionable call that might lead to a Patriots challenge. If it goes the other way, the stadium ops crew might be a little bit slower on the draw. This happens in every stadium, so it is not news. Again, the onus falls on the coaches in the booth to relay to the head coach on the sideline whether or not he should issue a challenge. Anyone who believes a coach would twiddle his thumbs on the sideline while he waits to see a replay on the television broadcast is someone who either never watches the NFL or is intentionally being obnoxious in an effort to stir up a conspiracy. I’m going to be honest about this one. I have no idea what he is talking about. Games are played on Sundays at 1 p.m., 4 p.m. (roughly), or 8:30 p.m., or they’re played on Mondays at 8:30 p.m., and once a year, every team plays on a Thursday at 8:30 p.m. What would a “preferable” time be? I don’t recall any Patriots games being played on a Friday at noon. Once more, let me rewrite your sentence, Rosenberg: What I’m saying is only mostly unfounded, and not totally unfounded. Because, you know, people whisper, so that counts for something! Perpetuating the idea that the footage never saw the light of day is something that is routinely brought up by obsessed Steelers fans who still feel cheated from 2001 and 2004 (even though the Patriots won in ’01 with a blocked field goal and punt return and ’04 in a 41-27 romp), not something that a professional writer ought to spread. The rule changed after Kimo von Oelhoffen hit Carson Palmer below the knees and tore the quarterback’s ACL and MCL. The rule became known as the “Carson Palmer Rule,” as defensive players were no longer allowed to hit QBs below the knees. When Terrell Suggs claims this rule changed because of Brady, it makes sense, because Suggs is a rival and does not hide the fact that he hates the Patriots. But Rosenberg? Again, spending 11 seconds on Google is all it takes for him to learn the actual truth. He’s proven beyond a reasonable doubt that he does not have 11 seconds to spare on Google. This was Rosenberg’s killer closing line. It says: The Patriots don’t actually violate rules. Really impactful words from Rosenberg there. The bottom line is that people like Rosenberg — you know, the people on the message boards who have nothing to say but “Spygate” — are the paranoid people in front of you at the grocery store, the people who take 30 minutes to get their items rung up because they’re convinced the grocery store is out to get them. Nobody is out to get you, and Bill Belichick is not the boogeyman. Anybody involved with this Sports Illustrated story ought to be truly embarrassed.